(Text automatically translated) Conveniently located, quiet and comfortable, perfect for exploring Paris with friends or family (totally suitable for children). Numerous books, comics, games and CD available. Spacious apartment (3 rooms), well organized and equipped with care. Canal Saint-Martin, the Republic of Oberkampf and the Marais district. Day and time of arrival at the apartment indifferent to agree with the owner. We loved the neighborhood and location. The apartment is warm, comfortable and inviting. The metro is easily accessible as are many restaurants and shops. We stayed here for four nights, and was delighted with the apartment. It has great big windows opening onto the street which was a blessing in the middle of summer. There was plenty of room for four of us, with a large dining table and comfortable lounge. The location was perfect as well, with an easy walk to both Republique and Goncourt stations. Celine was flexible and an excellent communicator - the whole visit was hassle free! The apartment has 3 large bedrooms, a Kitchen, Dining Room and Living Room and a wonderful bathtub and shower! It was great for 3 adults and two children aged 5 1/2 and 7 years old. We went to the District 11 Thai restaurant next door and had a great meal. We highly recommend this apartment! We loved staying at Celine's flat. We were two families with four kids between us. We needed a place that would fit us comfortably, be kid-friendly for the little ones, and be proximal to all of the things we wanted to do. Celine's home fit the bill perfectly. It is on the 3rd floor--4th floor to the Americans ;) -- so be prepared to walk up several flights. The neighborhood has plenty to do within walking distance, and easy bus or metro to all of the sights. We stayed in the apartment for a long weekend in November with 2 children. The apartment is spacious and homely and had everything we needed, so we immediately felt comfortable there. 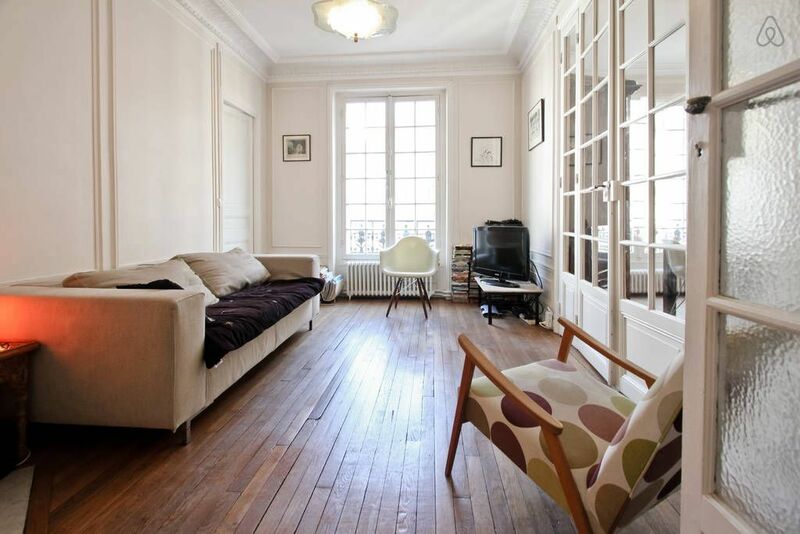 It is a typical Parisian apartment with wooden floors and high ceilings and is in a great area, very close to Republique and the Canal St Martin, so perfect for exploring Paris. "The beautifully furnished flat is in a really nice position not far away of a metro station, a very good bakery and a supermarket. The entire organisation was perfectly done and the lessor really cared for us. We enjoyed our stay there and would warmly recommend the flat." (Text automatically translated) Metro Goncourt Parmentier or Republic. Bus 75, 46 or 96. (Text automatically translated) Excellent restaurants (Chateaubriand, Le Dauphin) and lovely cafes nearby. Exception faite des week-ends dans l'année, pendant les périodes de vacances scolaires, un séjour de 3 nuits minimum est requis.